Before we start it’s important to make one thing clear. The perfect ski does not exist, if it did every manufacturer would only be making one ski, namely the perfect ski. Every ski from every manufacturer is a compromise. It might be perfect for a certain paddler in certain conditions, but no good for another paddler in the same conditions. Similarly a paddler would love a ski in one set of conditions, but not like it at all if the conditions change. For this reason all manufactures produce more than one ski. Fenn makes 11 different models, each optimised for a certain level of paddler and for a certain set of conditions. The Bluefin S is Fenn’s entry level ski. Anyone should be able to just jump in and paddle, very much like a plastic sit on top kayak. The big advantages over the plastic boats are much lighter weight, a very efficient built in rudder, and of course higher speed because they are much longer than plastic sit on tops. The XT falls into the same category as an intermediate multisport boat. About half of absolute beginners can stay in an XT (although very wobbly), the other half will go for a few swims before getting the hang of it. 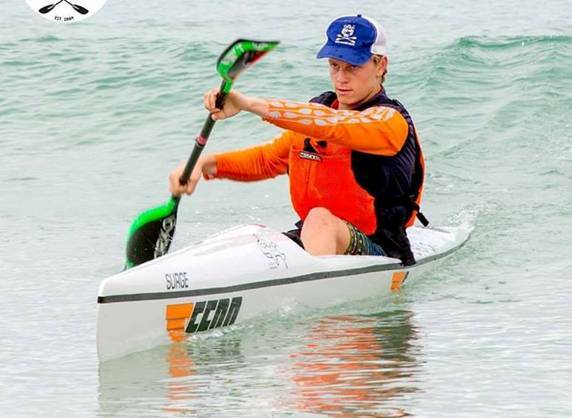 The Swordfish is probably the best ski for many competitive paddlers. It feels like a top end ski but has lots of secondary stability. It’s a bit like having trainer wheels, not much inherent stability when level but becoming more stable when it starts to lean. The Elite range of skis is aimed at the top end paddler. There is the standard Elite, Elite S, Glide and Spark. Stability wise there is not much difference between these 4 skis, with the Glide a bit less forgiving in messy conditions. Then there are the LS and Tarpon S skis designed and manufactured to meet Australian surf lifesaving standards, as well as two double skis, the Elite double for top end paddlers and the XT double for beginner/intermediate paddlers. After deciding on the model of the ski, the next step is to decide on the construction. With surf lifesaving skis it’s easy, these have to be at least 18kg heavy so there is no point using expensive carbon fibre and epoxy to save weight. The LS and Tarpon S skis are only available in either basic glass, or vacuum glass constructions. With ocean racing skis there is no weight requirement, so materials and methods to reduce weight are used. All new Fenn ocean racing skis now use a vacuum construction, with the difference between the 4 available constructions just coming down to the type of materials used. With better materials the ski can be made lighter and stiffer, but unfortunately also becomes more prone to impact damage (as anyone with a carbon framed bicycle will be able to tell you). Poly vac (white gelcoat finish): ~16kg. Vacuum glass (white gelcoat finish): ~14.5kg. The Bluefin S is Fenn’s entry level ski. It’s perfect for learning to paddle, and also as a recreational ski for those who don’t get a chance to get on the water very often. Feedback from the Bluefin S is that is really is a ski that a total beginner can jump in and just paddle away. Over the years I have found that many novices found the XT challenging, and were put off by numerous swims during their first attempts to paddle it. The Bluefin changes all that, even the first paddle will now be a pleasant experience. This is an intermediate ski, a bit of a challenge for total novices but usually mastered after a few days of paddling. The Swordfish is an intermediate/advanced ski. Read what real paddlers have to say about the Swordfish here. In flat water it’s slightly slower than the top end skis but not by much. I can easily stay with other paddlers at my level while sitting on their wash, but it requires a bit more effort paddling next to them. The big surprise is surfing. It is absolutely superb in big downwind conditions, especially when it gets a bit technical. The manoeuvrability and extra stability in steep messy waves makes it the most fun ski I’ve ever paddled. In these conditions the Swordfish is just as fast as or faster than any of the other top end skis. Seats are personal, what one person loves another will hate and the other way round. For me the Swordfish has the most comfortable seat of any ski I’ve paddled. The Swordfish S is a tweaked Swordfish. It has the same hull but a few changes have been made to the deck. The seat has been moved forward ~2cm which improves performance in flat and small conditions. Some paddlers complained about dead leg syndrome with the old Swordfish seat, the Swordfish S seat has solved that problem and many paddlers say they absolutely love the new S seat. The Elite is my favourite ski in big conditions. It just loves big wind swell, the bigger it gets the better the boat performs and the more fun it is. The rudder is very forgiving, instead of just letting go as was often the case with older skis it gives the paddler lots of warning when pushing the limits. The ski is very good at diagonal surfing, conditions often experienced at the Takapuna Beach series races. The Elite S is essentially a standard Elite with the same tweaking that was done to the Swordfish. It has a more comfortable seat located slightly forward, and less volume in the nose. It is my favourite ski in small conditions, in big conditions the standard Elite is still king. The Glide is a top end ski designed for the top end paddler. It’s the fastest Fenn ski in flat water, but in messy conditions a bit twitchier than the standard Elite. The Spark is tiny. It’s supposed to be for short paddlers only but I can just get my 6”3 with long legs to fit. It’s great into the wind and has the classic Fenn surfing feel, picking up little bumps really nicely. It handles big ocean swell really well, but with an all up weight (ski plus paddler) of 95kg water starts coming over the sides when jumping waves in large, steep wind swell. The Surge is a new top end, low volume ski designed mainly for flatish conditions. It is shorter than the other top end skis. The Bonito is a new ski specially designed for kids. 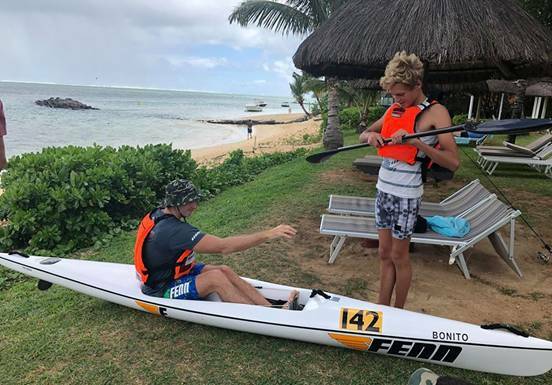 It’s also an amazing surfing boat in big conditions, one of the Fenn sons was paddling one in Mauritius and I was working hard to keep up in an Elite! The LS is the new Fenn surf lifesaving ski. It comes standard with adjustable footrests and is available in a deep or shallow seat version. If conforms to Australian SLS specifications and is available in NZ with or without the SLSA approval label. Looking at the evolution of ocean racing skis (which originally started off as spec skis) adjustable footrests are bound to become a standard feature of SLS within the next few years. Having a ski that will fit any paddler means that clubs no longer need a range of skis to cover a range of leg lengths. I took a deep seat LS out at the Mount in some big conditions and was amazed at how stable and well behaved it was. The nose looks really small when paddling in the ski but it never ended up diving under. Jasper Mocke winning the South African SLS champs. The Tarpon S is also designed around the SLSA rules, but is wider and has more volume than the LS. It is very stable and ideal for someone looking for a stable ski to have fun in the waves. As with all other Fenns it comes with a fully adjustable footrest system. All new Fenn surfskis have adjustable footrests, the doubles are even adjustable both front and rear. Most skis will accommodate paddlers from about 5’5 up to 6’6. The Swordfish S and Elite S have a smaller bump and will accommodate paddlers shorter than 5’5. The Elite Spark is designed especially for shorter and lighter paddlers.